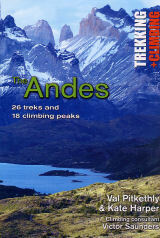 This stunning guidebook, covering 26 treks and 18 climbing peaks, is an indispensable tool for both the experienced climber and the first-time trekker visiting the Andes - one of the world's greatest, yet least known, trekking destinations.Covering the range from Venezuela in the north to Patagonia in the south, the book offers clear, authoritative descriptions of treks - some short, two-day-hikes and other, more strenuous two-week treks. The guide is also crammed with practical information on travel, techniques and equipment, so visitors will have as safe and healthy a tour as possible.Top-class cartography and strip maps pinpoint every route and give a reliable idea of distance and timings. The book is further enhanced by more than 100 fantastic photographs. Fully updated for its second edition, the book also features an eye-catching new cover.